For Sale: Two gorgeous male maltese puppies. These two teacup maltese are the offspring of my tiny maltese Frenchy. 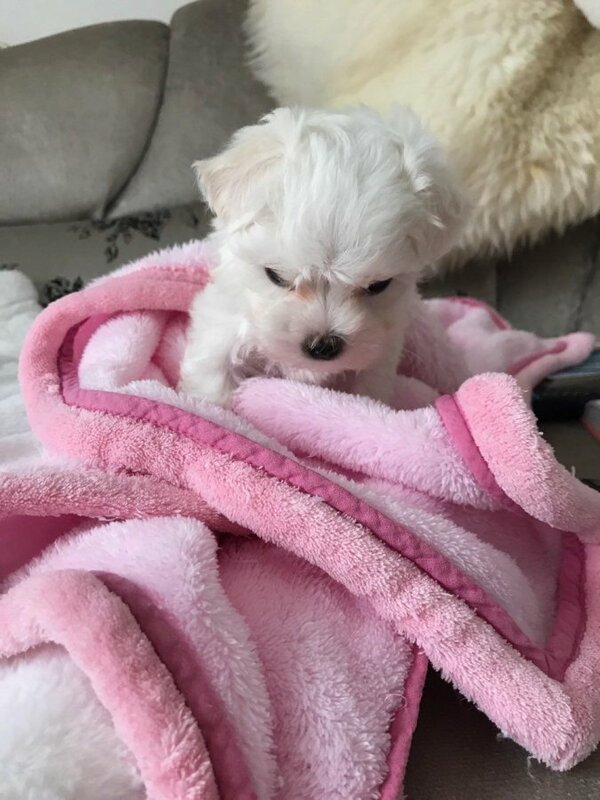 Frenchy is a teacup KC registered maltese with a fantastic pedigree which include champion french bloodlines. Mum has a lovely temperament and gorgeous coat. I am a licensed breeder with over ten years experience in breeding dogs but my specialities are Maltese's and Pomeranians. My little puppies are already growing well and are very healthy with mum comfortably able to whelp the two of them. The puppies have been brought up in a family home and are well used to everyday sounds, children and other dogs. They are already developing their own cheeky personalities and love to play. The puppies will be able to go to their new forever homes on 28th June when they will be 8 weeks old. Please feel free to get in touch with any questions you may have about these two beautiful boys and any visits to see them are welcomed. I would imagine that with the strength of their pedigrees interest in these fabulous pups will be strong so would encourage anyone with an interest to get in touch early. Contact marly: Teacup Maltese For Sale.